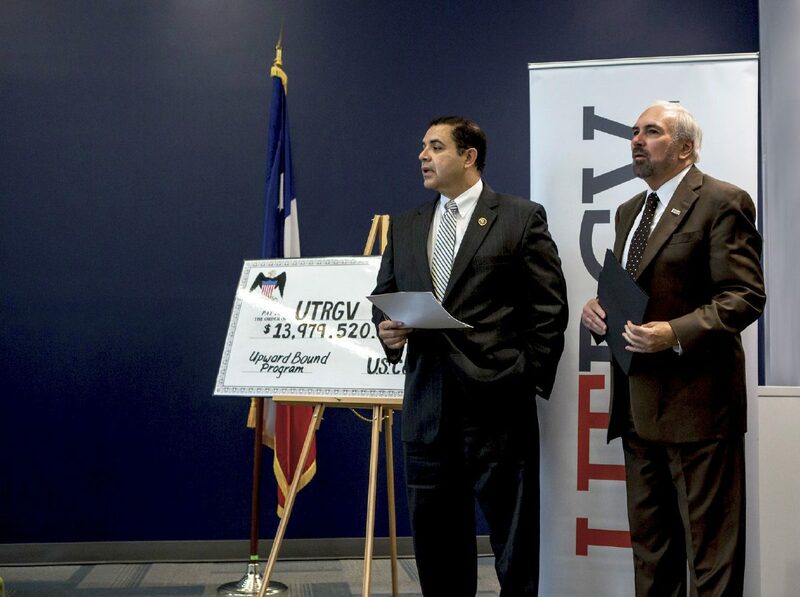 During a press conference May 26, U.S. Rep. Henry Cuellar (at left) and UTRGV President Dr. Guy Bailey announced the receipt of nine federal grants under the U.S. Department of Education’s Upward Bound Program, to help Valley high school students prepare for college. UTRGV will receive $2,795,904 the first year, beginning September 2017, and over the five years of the program could receive nearly $14 million. The funding will allow four current Upward Bound programs in Hidalgo and Cameron counties to continue, and will provide for five new programs in Port Isabel, Raymondville, Lyford, La Grulla and Rio Grande City. MISSION — A federally-funded program that has been guiding and mentoring students on their way to college for 45 years was not only renewed this year, but received $13.9 million to also expand to more Rio Grande Valley communities over the next five years. U.S. Rep. Henry Cuellar, D-Laredo, made the announcement of the awards Friday at the Mission CEED Building along with UTRGV officials and representatives from the offices of U.S. Sen. John Cornyn and U.S. Rep. Vicente Gonzalez, D-McAllen. The funding came through Upward Bound grants from the U.S. Department of Education, which aims at helping low-income or first-generation high school students through the transition to college. The program, based out of the University of Texas Rio Grande Valley, is currently serving Edinburg, Edcouch-Elsa, La Joya and Brownsville, but instead of just renewing the four grants funding these areas, program officers and UTRGV officials applied for five extra grants to expand to underserved areas such as Willacy County, Port Isabel and Rio Grande City. The grant will be broken down over five years with the university receiving the first grant of close to $2.8 million in September 2017. The money will be used to hire more staff to serve the new areas and begin recruiting students starting the fall, Leal said. These staffers are the ones in charge of visiting schools and keeping track of the students throughout their entire high school career. Most students don’t have much of an idea of the process and need for early preparation. Even though the program is based out of the university, students are not only encouraged or exposed to UTRGV, but to any university of their choice. Some of the funds are also used to take participants on college visits.